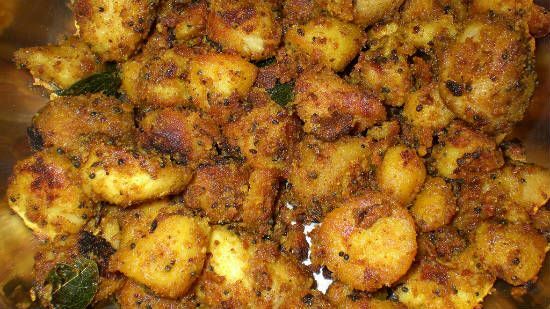 A popular and delicious South Indian side dish. 1. Boil the seppankizhangu, peel the skin and cut into small pieces. 2. Transfer to a mixing bowl. 3. Add red chilli powder, turmeric powder and coriander powder. 4. Sprinkle a bit of salt and mix well until evenly coated. 5. Keep aside for 10 to 15 minutes. 7. Fry the mustard seeds seeds, dal and red chillies for 30 seconds. 8. Add curry leaves, marinated colocasia pieces and tamarind extract. 9. Increase flame to high and cook, stirring from time to time to prevent sticking to the bottom, for 5 to 10 minutes. 10. When the colocasia pieces are crisp and moisture has evaporated, remove from flame. Note: If you need more crispness add some more oil while frying. Feel free to comment or share your thoughts on this Seppankizhangu Roast Recipe from Awesome Cuisine.